This is a livery agreement for situations where the yard owner acts as an agent to the sale and receives a commission if he sells the horse. In addition, he receives livery fees while the horse is on the yard. 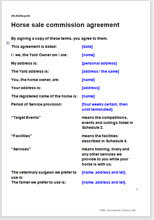 This agreement is between a livery yard owner who agrees to take commission on the sale of a horse, and the owner. As written, like any livery contract, the owner also pays for livery while the horse is for sale and has personal access to the yard's facilities. Sellers often prefer to sell the horse from a yard. The yard may have superior facilities in which to allow the seller to demonstrate the horse's ability, riders on hand who can get the best out of the horse, and surroundings that impress buyers; and the owner doesn't need to spend time answering questions, or arranging and attending viewings. The deal should, however, like any business transaction, be recorded in a document that covers all the points. Writing it down not only protects both sides from later disagreement about what the terms were, but also protects the yard owner's livery business, in that the yard owner has recourse to the horse owner if something goes wrong (such as the horse damages his stable). Additionally, the terms of the livery are recorded, which not only gives the horse owner an expectation of additional costs on top of the sale commission, but also sets out the obligations of the horse owner. Although yard owners are more likely to want to set the terms of the agreement (and thus use this template), a horse owner could also use this document to gain more favourable terms with a seller who does not have a standard sale agreement. Although this document is drawn to protect the yard owner's interests as strongly as possible, the draftsman has also considered what your clients will think when you send it to them. Although it is written in non-legalistic language, the legal effect isn't reduced. However, horse owners will not worry that they have to see a solicitor before they sign. If you feel that some of the strictest suggestions we have made are too strong, you can soften them. The procedure for selling is covered in full. Schedule 2: livery arrangements and costs. "Yes the document was very useful, easy to read and understand and contained everything I needed. I will definitely refer to your site in the future. "